EAST has just published its third European Fraud Update for 2016. This is based on country crime updates given by representatives of 18 countries in the Single Euro Payments Area (SEPA), and 6 non-SEPA countries, at the 40th EAST meeting held in Bucharest, Romania on 12th October 2016. Card skimming at ATMs was reported by nineteen countries. The usage of M3 – Card Reader Internal Skimming devices continues. This type of device is placed at various locations inside the motorised card reader behind the shutter. Seven countries reported such attacks. International skimming related losses were reported in 57 countries and territories outside of the Single Euro Payments Area (SEPA) and in 10 within SEPA. The top three locations where such losses were reported are the USA, Indonesia and India. Skimming attacks on other terminal types were reported by eight countries and six countries reported such attacks on unattended payment terminals (UPTs) at petrol stations. ATM malware and logical security attacks were reported by eight countries all involving the usage (or attempted usage) of ‘black-box’ devices to allow the unauthorised dispensing of cash. 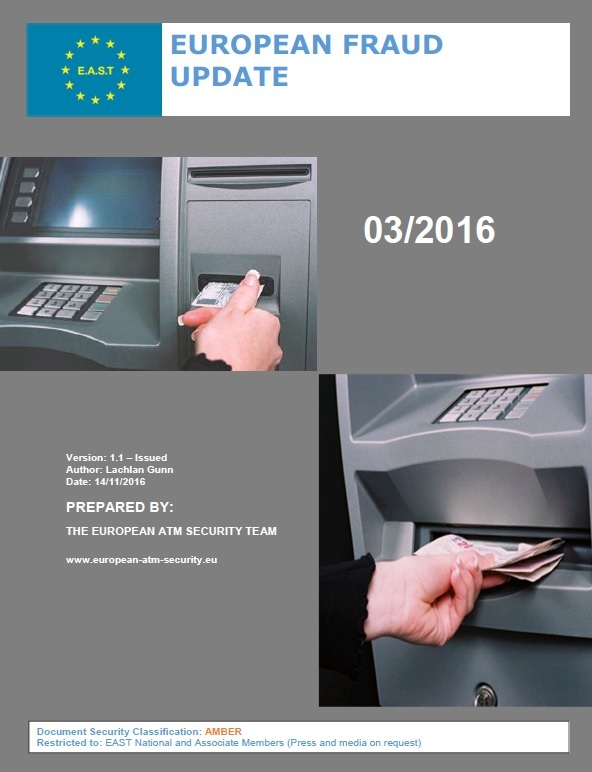 To help counter such attacks the Europol document ‘Guidance and Recommendations regarding Logical attacks on ATMs’ is now available in four languages: English, German, Italian and Spanish. Ram raids and ATM burglary were reported by nine countries and eleven countries reported explosive gas attacks, four of them seeing big increases in such attacks. The use of solid explosives continues to spread and six countries reported such attacks. Payment fraud issues were reported by eight countries. Two of them reported data breaches and one updated on contactless card fraud. One country reported fraud relating to a popular games console and another fraud related to advertising on social media.